Bombsheller Art Labs‘ inaugural exhibition showcases Few and Far Women’s avant garde creativity, texture-rich typography, urban iconography, and explosive color stories. Dedicated contributors to the global project of women in art, Few and Far Women celebrate their individual expressions, and collaborate with other dedicated and talented women from around the world. The F&F team consists of artists elevating their craft, inspiring their communities, and challenging the world to go beyond the hurdles set before all of us……. beyond the glass wall of the gallery “art world”…..
artists who desire to create, define, and build their unique brands. with double-your-trouble simultaneous free art events on Wednesday June 18, 2014! 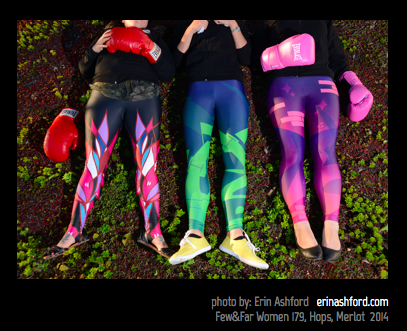 Bombsheller is a new on-demand personalized fashion manufacturer right here in Seattle, empowering artists to transform their art into fashion while earning a royalty on garments sold, leggings to start. We manufacture our shells (leggings) on-demand in-house, and encourage artists, fashion and graphic designers……and you…..to design your own garments! Bombsheller Art Labs is a new kind of maker gallery……a “collaborative” gallery… where designer/artists and patrons are empowered to create, innovate, and exchange skills and ideas. Generating both art community and art commerce, Bombsheller Arts Labs exhibits an eclectic selection of works, installations and performances, with an emphasis on tech and fashion influenced works created primarily by local Northwest artists bent on furthering artistic expression and collaboration fueled by technological innovations re-imagining the fashion industry.